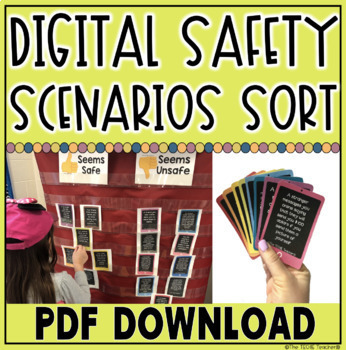 Spark classroom conversation about digital safety with these scenario cards that can be printed & sorted into two categories: Seems Safe & Seems Unsafe. Most of the scenarios focus on digital communication and being aware of who you are talking to online, via text message or through email exchange. Stranger danger is discussed however I believe it is important to reiterate that not all strangers are bad/dangerous-we just need to look for the red flags and be careful what we share. I use this sort after reading aloud an online safety children’s book like A Fabulous Friend Machine, Chicken Clicking, Webster’s Friend or The Cyber Spying Glass. Links to these books on Amazon are included in this download. 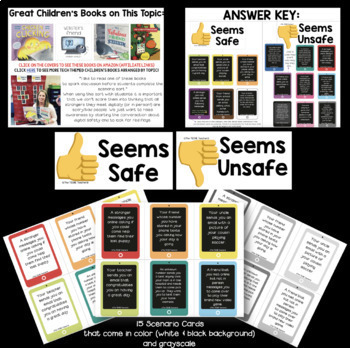 Even though I have marked this resource as a sort that can be used with 3rd-5th grade, it can still be used with younger grades. I have done this sort with kindergarten and just had more simple conversations and explained situations like talking to someone in an online chatroom. 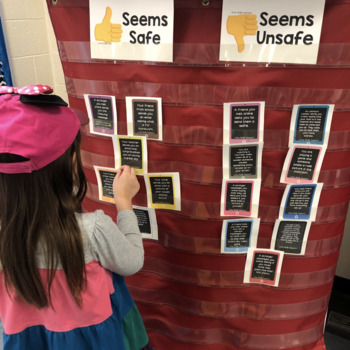 Have students initially respond by giving you a thumbs up or thumbs down in regards to safety and then discuss! This download comes as a secured PDF document. Print, cut and sort! 15 scenarios are included that come in color (one set contains iPads with a white background and another set has iPads with a black background) and grayscale. That makes 3 sets of the same 15 cards. You can also find an answer key in this download!